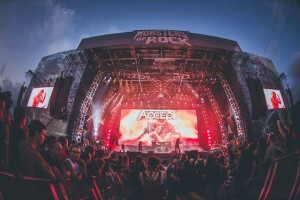 The Apple iPad has become a common fixture on stages worldwide, especially with House of Worship Teams. 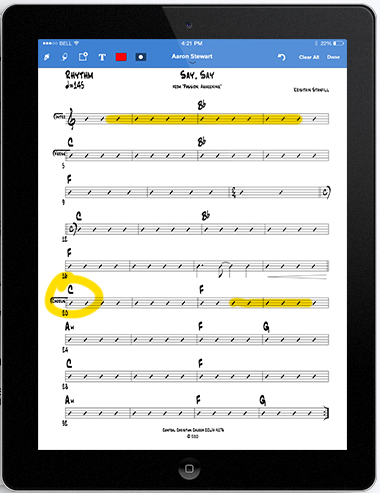 Gone are the days of clunky music stands covered with sheet music falling all over the stage, when all can be handled with a simple sheet music App. This is music to the ears of a Pivitec Personal Monitor Mixer user, as the V2Mix-Pro Mixer App is just a 4 finger swipe away from that sheet music! 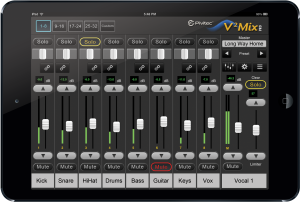 Here we have highlighted some of the App possibilities to share your iPad with V2Mix Pro. Planning Center is an all encompassing group of apps used for much more than sheet music. It can organize nearly any aspect of worship team function, depending on what units you purchase. Shown here is the Music Stand App. 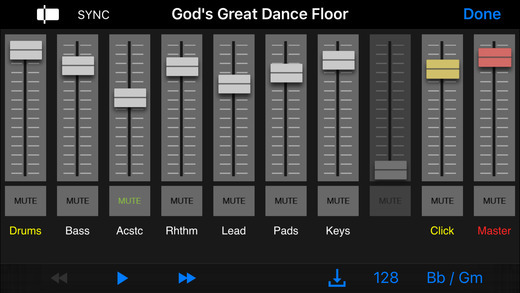 This app will provide the worship team with a talented backup band in a box, controllable on stage. Songs can be purchased or your own songs uploaded. The app also features a click track. 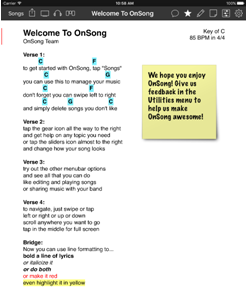 The Onsong App lets you import chord charts in many formats. They have created an easy-to-use application for iPad or iPhone for quick music access. The OnSong allows you to quickly and easily access your music for performances. When you are on stage, the app can easily handle all aspects of performance. Best for chord charts only. The use of images in this email is for demonstration purposes only, and does not imply an endorsement. 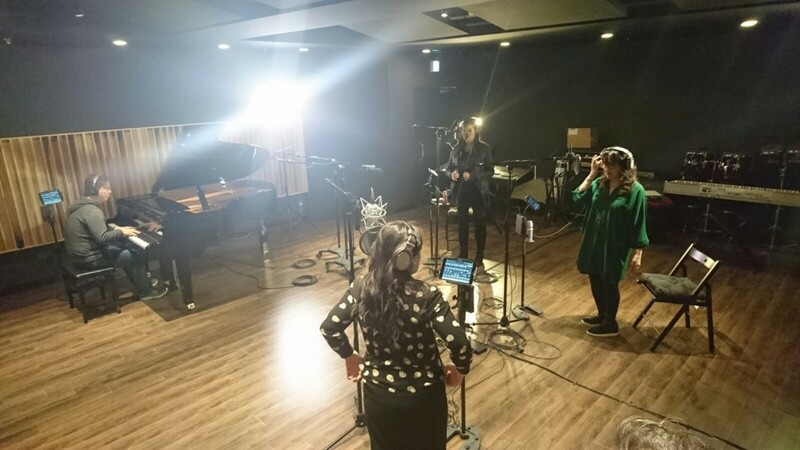 When Tiffany Chan, a young and enterprising recent graduate of Berklee College of Music, saw the need for a studio that had a more youthful vibe she founded Electone Music Studio in her native Hong Kong. In collaboration with the renowned acoustic designer K.K.Kong and a team of engineering consultants, Chan built EMS for professional recording, rehearsal and mixing featuring an AVID S6 mix surface and many old and new outboard choices. Pivitec’s network interfaces can provide a gateway to Dante with some assistance from 3rd party converters. You can easily connect your Pivitec Personal Monitor Mixing system or Ethernet AVB Network to a Dante system. We will outline several Methods in coming newsletters, each with its own advantages. In Part One we used the Pivitec e64i/o-MADI. This is advantageous if you need the full 64 channel Bi-directional capability that MADI offers. 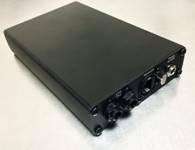 Here, the Pivitec e16i-ADAT is used for 16 or 32 channels from Dante to Pivitec PMM/AVB. ADAT- How to connect our e16i-ADAT to a Dante network. Using the Focusrite REDNET 3- you can convert 32 channels of DANTE format to 32 channels of ADAT at 48k in four 8 channel streams through Toslink optical fiber cables. Please refer to the REDNET 3 Userguide to assist you in its setup. The e16i-ADAT will recover clock from the REDNET 3 ADAT stream. Use a single e16i-ADAT for 16 channels, or 2 e16i-ADAT units for 32 channels. Connect as shown below. Connect the e16i-ADAT(s) to your Pivitec system switch, and set up the system as described in the System Quick Start guide. 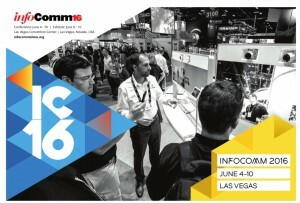 We would like to thank all of the Reps, Dealers and Customers that stopped by the Pivitec Booth at Infocomm 2016. Great to see some good customers and meet future good customers! Would your organization like to demo a Pivitec system? Pivitec’s network interfaces can provide a gateway to Dante with some assistance from 3rd party converters. You can easily connect your Pivitec Personal Monitor Mixing system or Ethernet AVB Network to a Dante system. We will outline several Methods in coming newsletters, each with its own advantages. Here, the Pivitec e64i/o- MADI is used. This is advantageous if you need the full 64 channel capability that MADI offers. For more details, please see the Interfacing Pivitec with Dante Networks Page. BETHLEHEM, PA- Mill City Church, based in Ft Collins, Colorado was founded in February 2012 as a non-denominational church plant by Lead Pastor Aaron Stern, and has quickly grown to welcome 1,300 members at three services every Sunday. Mill City meets at the University Center for the Arts, part of Colorado State University. One of the challenges the church faces is that its main meeting room, Griffin Concert Hall, isn’t always available, so for several weeks at a time the congregation may need to meet in another venue in the facility. Add to that frequent off-site activities, and it becomes obvious Mill City’s audio system must be extremely versatile. 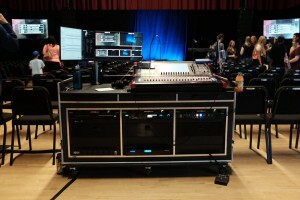 The unique requirements of a mobile church include equipment that is reliable and portable and lighting quick to set up, as well as versatile in ability to fill various venues, and implement stored settings for each. To meet the church’s special needs, Casey Batezel, Technical Director for Mill City, chose Pivitec e32 Personal Monitor Mixers and wireless IEM’s. The e32 mixers share a rack with the wireless IEM transmitters and AVB switch. “We want everything to look clean, be easy to use, and fast to setup. As a mobile church, these criteria are sometimes hard to meet. 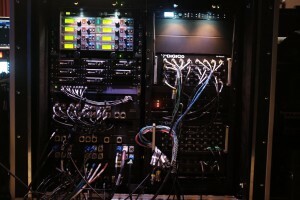 Every personal monitoring system we researched required an unimpressive entry-level digital console, a monitor engineer and separate console, or tons of CAT5 cables run around the stage. We wanted a system which could interface well with our DiGiCo SD9 console and be setup as fast as possible. 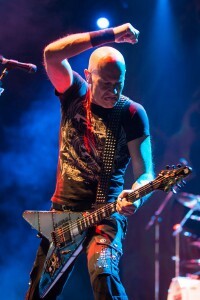 We also needed the system to sound as high-quality as possible,” explains Batezel. 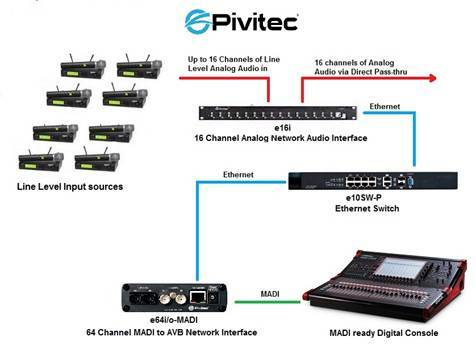 The Digico SD9 is connected by MADI to a Pivitec e64i/o-MADI bridge, which is capable of 64 bidirectional channels, to an Extreme AVB enabled PoE switch. The e32 Mixers connect directly to the switch and are controlled wirelessly with Apple iPads running Pivitec’s V2Mix Pro app. An AVB-capable Mac computer can be connected directly to this system for recording and playback. 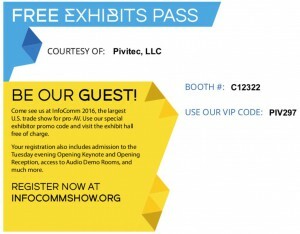 Your Free Exhibit Hall Pass for Infocomm 2016! We will be in Booth C12322 with EM Acoustics. 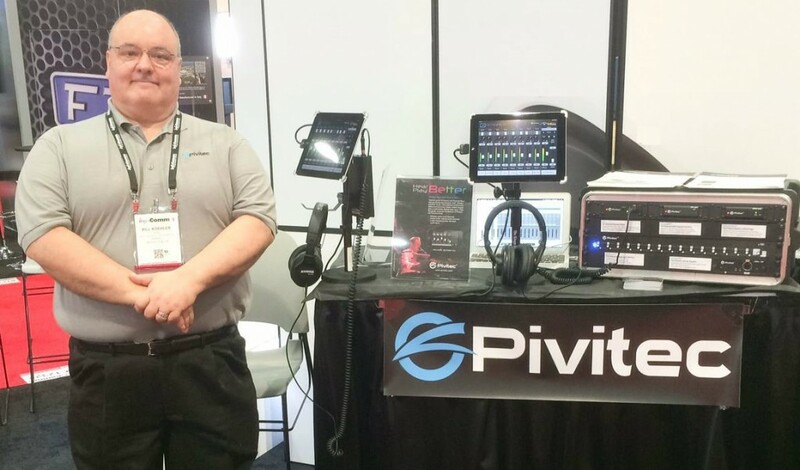 Stop by to meet us and see the Pivitec Personal Monitor Mixing system in action. You will be able to mix tracks on our V2Mix-Pro app at the booth. We look forward to seeing you there!! 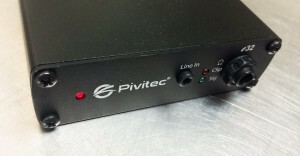 Pivitec offers new Extreme AVB Switch choices. Do I need an AVB compliant switch? No, well maybe, it depends. A standalone Pivitec system will operate in a legacy Layer 2 mode without AVB. A Managed Ethernet switch, such as our e10SW-P, may be used when only Pivitec devices and Wi-Fi router are to be connected to the switch. An Ethernet AVB compliant switch, such as the Extreme X430 above, is required only when an AVB compliant device such as an Apple Mac computer for recording and playback, or AVB compliant console is connected to the switch. PCs are not currently AVB compliant. Pivitec devices will AUTO-CONFIGURE to work with non-AVB or AVB compliant switches. For the Pivitec system to function properly you cannot mix non-AVB and AVB switches in the same system. The Pivitec e16i/o-MY card is your gateway to bidirectional AVB connectivity between your Yamaha Mixer with Mini-YGDAI card slots and many other AVB devices. The Pivitec e16i/o-MY card will transmit 16 channels in and 16 channels out simultaneously. Multiple e16i/o-MY cards may be used in the same Mixer to boost the bidirectional channel count through an AVB enabled switch such as the Extreme X430 series featured above. Pivitec has released the e32.2 Mixer with a new sleek look. The new circuit design is cooler running to reduce heat in the rack. The e16i 16 Channel Analog Network Audio Interface enables you to bring analog line level outputs from wireless mic receivers and keyboards into your console digitally. Simply connect up to 16 line level outputs from these devices into the e16i, connect the e16i to either an AVB or standard Ethernet switch, and then onto your console via AVB or Pivitec's bi-direction interfaces for Yamaha (e16i/o-MY) and/or MADI (e64i/o-MADI). This works with or without Pivitec's Personal Monitor Mix (PMM) system operating on the same network. You have now added an inexpensive 16 channel line-level stage box. If you take advantage of the direct Pass-Thru jacks on the back of the e16i maybe to a mixer for recording, you can add Stage Splitter to the e16i roster of functions. There are more creative uses for our Pivitec family of devices on the way. Stay tuned! Pivitec LLC has released an improved version of the e32 Mixer used in the Pivitec Personal Monitor Mixing system. The e32.2 is functionally identical to the e32, but with a cooler running design. The e32.2 is fully compatible with all previous Pivitec Personal Monitor Mixing products. In addition to the industry leading e32 Personal Monitor Mixing System, Pivitec offers a range of Ethernet AVB Network Audio Interfaces including the "World's First" MADI to AVB bridge. The e64i/o-MADI is already proving itself in applications ranging from broadcast to live production and installations. Other Ethernet AVB Network Interfaces in the flexible e16i series include 16 Channel e16i-ADAT and e16i Analog as well as the e16i/o-MY Card for Yamaha digital consoles. All Pivitec Network Interfaces support the 802.1 Ethernet AVB Standards and can be used as recording and playback devices on compatible computers. 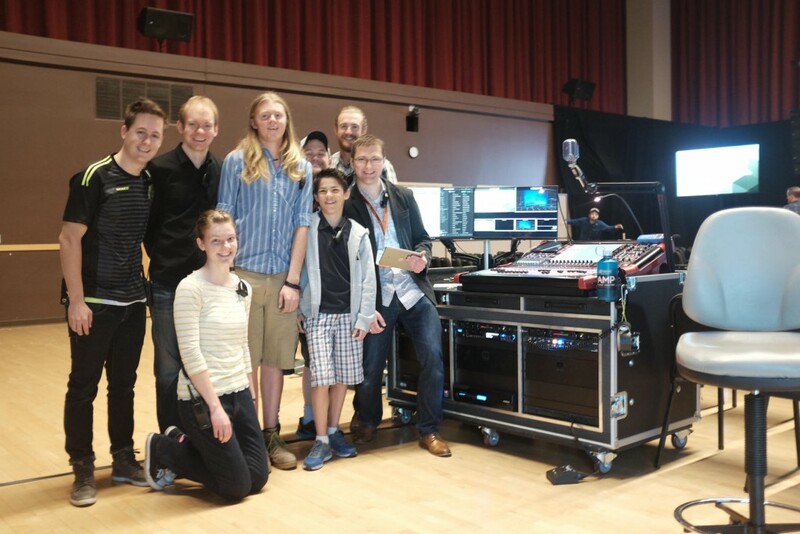 When NOW Church upgraded to an AVB networked audio option, Pivitec was the logical choice for their large worship team and choir. Here, Creative Director Ricky Perinchief, and Worship Pastor Lindsay Seals discuss the change. Visit Pivitec at InfoComm 2015 + VIP pass for free admission. 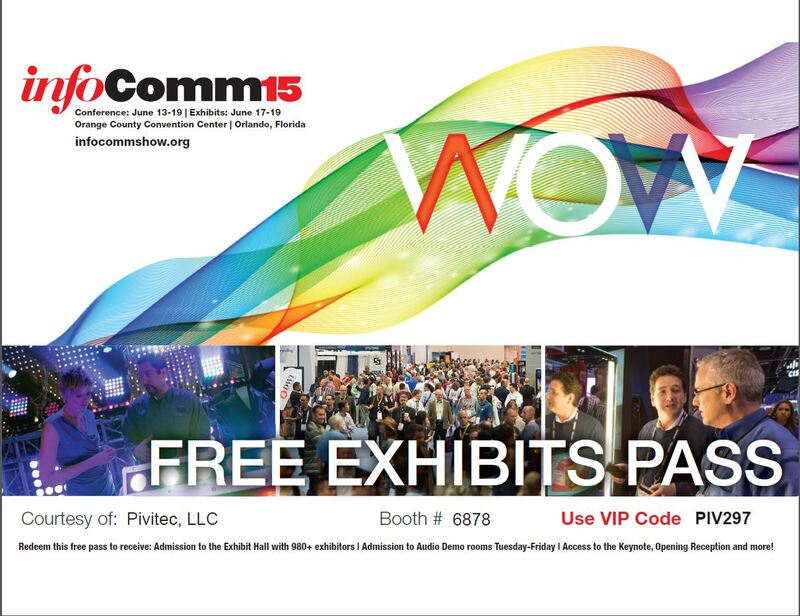 This year at InfoComm 2015 Pivitec will be offering hands-on demos of the e32 Personal Monitor Mixing System as a sponsor of the Technologies for Worship Live Events Stage at booth 6878. Visitors will have the opportunity to mix the NOW! Church Band live and test drive a complete digital Personal Mixing System that includes Sennheiser Evolution G3 Wireless Monitors. Tom Knesel will also be presenting a Case study on the rock band ACCEPT and how Pivitec's advanced AVB networking and PMM system streamline this busy band's monitor rig at the AVnu Alliance Pavilion Booth 551. Presentations are Wednesday, June 17th at 10 am, and Thursday June 18th at 2 pm.